Joyce was one of our tireless workers, who made a contribution right up to the end. In the early years she would look after the refreshments and would bring freshly baked cakes and other goodies for our supper after the meeting. It was always going to be a good night when Joyce arrived with the kettle and other goodies. We used to pay 50c towards our supper and at the end of each year Joyce would make a donation of the excess funds to the Society. I don't think she ever calculated the cost of making those wonderful cakes in her costs as the donation was always fairly large. I can remember at the Conferences she would always have extra sandwiches in the Friday night, so those members who visited her and Tom in their room got a feed. In the 90s when we went through a slow down Joyce joined the Council, more because she wanted to support Tom and to make sure the Society continued to function well, than a desire to be on the Council. She nursed Tom through his illness and we were all very glad to see Joyce back at the meeting shortly after Tom's passing. I always used to have a smile at the meeting when Joyce would say "Can I say a few words" as we were sure to hear a lot of our history. Joyce was awarded the Paul Simon medal for her contribution to Numismatics in 2006 a picture of Joyce and her medal can be seen above. 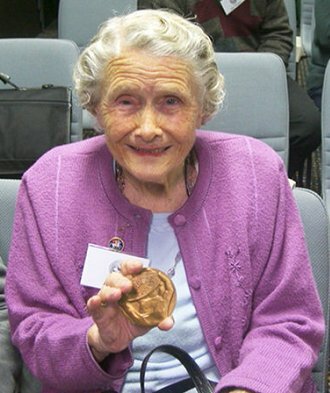 In September 2008 Joyce was awarded the ANS Bronze medal. We were a bit slow in recognising her services. After the presentation she told me she would tell Tom all about it when she got home. One other secret. Joyce was the only ANS to have her 2013 ANS Centenary Medal. After she had her 1913 shilling encased in her medal, she persuaded me that she should have it to show Tom when she got home. I am such a softie that I gave it to her. I am glad I did. However don't any other member try getting theirs. Joyce Alma Hanley and her beloved husband Tom, were an integral part of the lives of their friends and close neighbours who resided in Pacific Street, Caringbah. The members of those neighbouring families, both past and present, who are here today, bear testament to this fact. I know that those of you here today, all have your own treasured memories of this beautiful woman and her husband Tom. My brother Scott and I would like to take this opportunity to share some of our own recollections, in order to bear witness to the generosity of spirit that was such a feature of Joyce’s life and relationships.Joyce arrived in Caringbah, with her husband Tom, in 1954. They made their home at 75 Pacific Street, where they were to remain for the rest of their lives. Pacific Street at that time was unsealed and consequently had no kerbing or guttering. Many of the house blocks in the street, and in the surrounding area, were vacant and remnant bush was still a feature of the area. Young families arriving there often found themselves far from familiar faces and surroundings. My own parents, John and Elizabeth Webb, settled next door to Joyce and Tom in 1956. A young couple from the eastern suburbs of Sydney, they arrived with three very young children, and one on the way, to take up residence in a single fibro clad garage and small attached laundry. Joyce immediately made our mother welcome by introducing herself to my sister Kathy, who was playing in the backyard, asking if her mother would like, “...a cuppa”. This was the start of many such cups of tea over the years that followed. A loyal and steadfast friendship developed from that first meeting, this being facilitated in no small way by a missing piece of fence paling in the wooden boundary fence between Joyce’s yard and our yard. This head height opening in the fence served as a thoroughfare for “...scraps for the chooks” (wrapped in newspaper), from our side of the fence, and a regular supply of offerings from Joyce’s side of the fence, that included vegetables from the garden, hens eggs, memorable baked custards (Dad’s favourite), stewed rhubarb deserts, and pikelets still warm from the pan. This opening also provided a place for regular conversation between a younger woman dealing with the challenges of raising four young children and a more mature woman constant in her support and encouragement. Joyce and Tom’s backyard was a place of wonderful sights, sounds and smells for small children. A sizeable chook pen that harboured a fearsome rooster; seemingly endless beds of vegetables; an intriguing fish pond and a wonderfully cool and exotic fernery decorated with hand painted, metal images of birds. Moving around the garden, in the company of either Auntie Joyce or Uncle Tom, was an enriching experience. This was a loving and peaceful place, a place in which a child felt welcome, safe and nurtured. Joyce and Tom were unfailing in their support of our family. During our pre-school years, when our mother was occasionally hospitalised, Joyce and Tom would care for my younger bother Scott. This ongoing level of support and commitment resulted in Joyce and Tom being seen by the Webb children as extended family members, with all of the love and trust that accompany strong familial relationships. Visiting Joyce and Tom’s household as an adult, was an equally warm and welcoming experience. Afternoon tea would be served according to a strict protocol - served on the best crockery, accompanied by starched serviettes and tea made with tea leaves and poured through a strainer. Auntie Joyce would graciously host the occasion, while Uncle Tom, seated at the head of the table, would hold you captivated with his wonderful stories, sparkling eyes and good humour. Joyce’s inherent graciousness on these occasions, reinforced your sense of respect and regard for this grounded and caring woman. Joy’s support for her husband Tom was unwavering. For all of their married life Joyce was a rock of support for the man she loved. It was a testament to her sense of independence, and her strength of character, that she was able to carry on without him during the last nine years of her life - a time when she missed him terribly. Joyce had a remarkable mind which remained sharp through the last days of her life. Her knowledge was broad and she was able to form clear and concise opinions on a wide range of topics. Her ability to remember the detail of the lives of those around her, demonstrated not just her clarity of thought, but also the selflessness and genuine concern for others, that were key features of her character. Joyce loved to travel, and organised many trips away for Tom and herself. Wherever they went their good humour and sense of respect in their dealings with others, caused them to make friends easily. They would always return home enriched by their experiences and their new friendships. 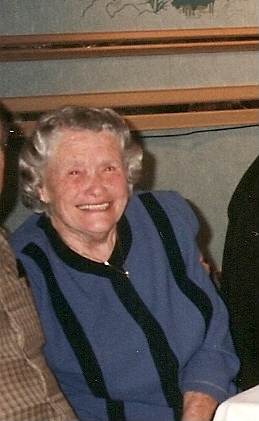 and in her later years the deep affection and commitment of Julie and Eddie Melkie. All of us here today, whether members of Joyce’s immediate or extended family, are united - both in our grief, and in our love for this remarkable, noble and yet humble woman. Perhaps Joyce’s greatest gift to us is the love that she leaves amongst us. Love is, above all, the gift of oneself and Joyce gave unconditionally of herself, to all of us who were fortunate enough to know and love her in return. Joyce is now reunited with her beloved Tom, free of the aches and pains that challenged her during her final years. We who are here today have all been touched by the wellspring of love that Joyce drew from - perhaps we will have occasion to pass on this love, to those we touch in our own lives. God has blessed Joyce, may she and Tom now rest together in peace.